At Sunnyside Dental, we offer a fully computerized, child-friendly office providing the highest level of care to our patients. Our dental services include family and cosmetic dentistry, Invisalign®, Professional Teeth Whitening, and Botox®. You can count on the gentle Sunnyside dental team to provide quality dental care in a friendly environment. If you have any questions or would like to know how we can give you a better smile, call our office today for an appointment (250) 764-7794. 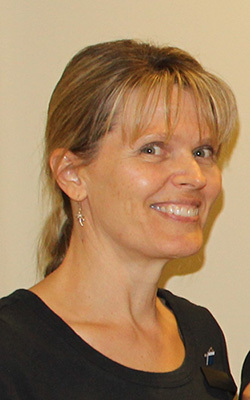 Dr. Jaana Koning is originally from Finland, and graduated from the University of Turku, Finland, in 1991, receiving a degree as Doctor of Dental Surgery. She then moved to Canada in 1992, and is fully certified to practice as a dentist in Canada by the National Dental Examining Board. 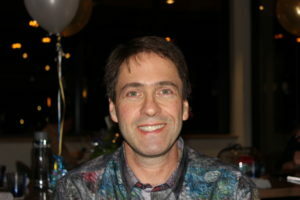 With over 25 years of experience, “Dr. Jaana” has been providing dental care to patients across the country. For example, she’s worked in Ontario, far up in Canada’s Arctic provinces, and here in British Columbia. Also, here’s an interesting fact—Dr. 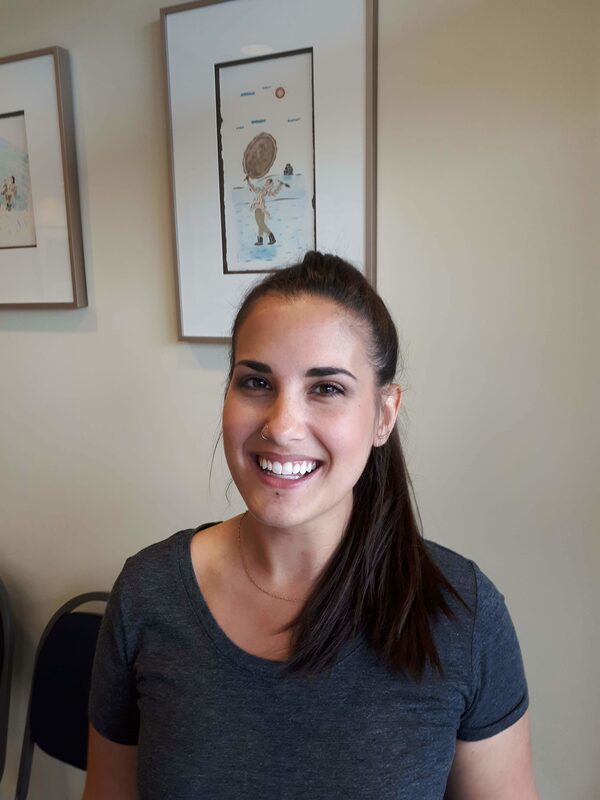 Jaana has done the most Invisalign® cases in the Okanagan of any other female dentist! Because of her experience with so many different cases, Dr. Jaana understands the full range of treatment options available to each of her patients. In addition, Dr. Jaana is a full and founding member of the Dr. David Galler Invsalign® mentoring group. As a result, she has access to a network of other professionals dedicated to Invisalign® treatments, as well as helping each other with additional clinical advice. 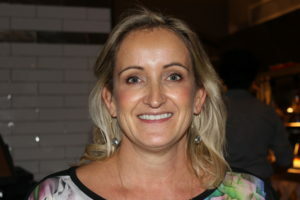 Her treatment philosophy is to be honest and direct with her patients, and to use the latest in techniques while trying to make patients as comfortable as possible. In her spare time, Dr. Jaana loves to ski, take walks, and swim. 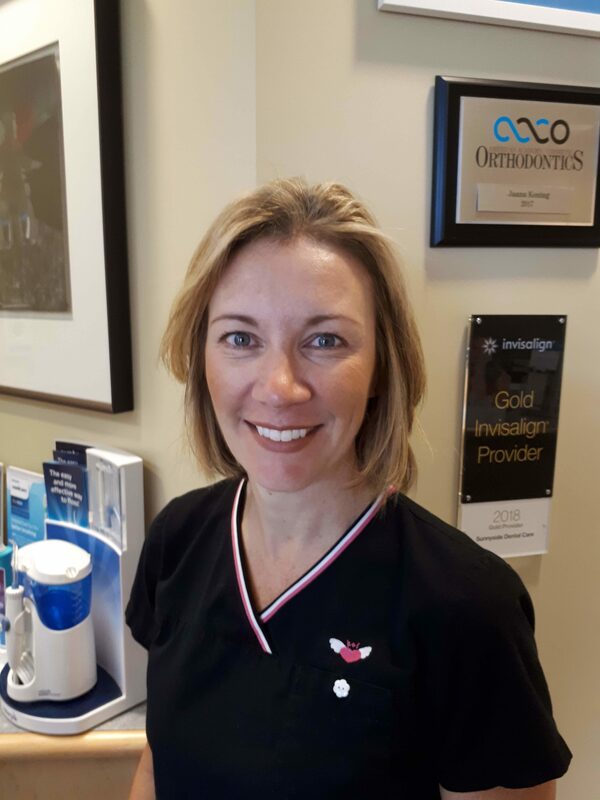 Dr. Jaana moved from Toronto to Kelowna with her family in 2004 and is proud to show new patients her bright, state-of-the-art, and comfortable clinic. 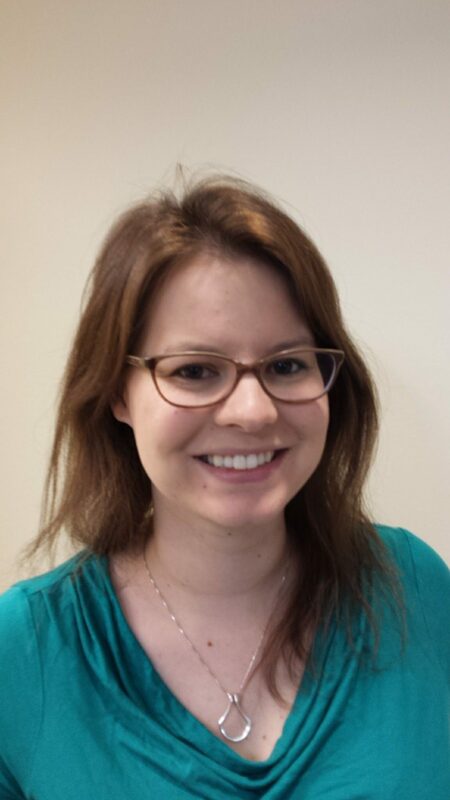 Alisa joined our team in 2017, and loves working with a friendly, professional team in a clinic offering patient-driven care. Alisa recently moved to Kelowna from Edmonton, Alberta. She plans to improve her skiing skills this winter. Please drop by the clinic to say “hi” and welcome Alisa to Kelowna! With 20 years experience, Tara was looking for a leading edge, family-oriented practice to join and found Sunnyside Dental. She has been a great addition to the team and all of our clients love her! If she’s not at the office, then Tara is at the beach with her family or spending time in her garden. Peter supports the team by making sure the office is kept in order and equipment is running smoothly. In addition, Peter coordinates staff schedules, ensures that supplies are available at all times, and helps with the website. If he’s not in the office, then Peter enjoys skiing and going for walks in the Mission. Andrea is originally from North Van, and moved to the Okanagan in 1995, where she raised her 2 boys and is now a proud grandmother. 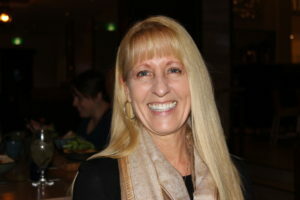 She has been a CDA for over 30 years, and is very compassionate with her patients. A lot of her career has been spent working as an orthodontic assistant, and as a result, she has significant experience with Invisalign. She loves playing the piano, quilting, and hiking. Also, she regularly takes her big orange kayak on the lake with her husband Cliff. 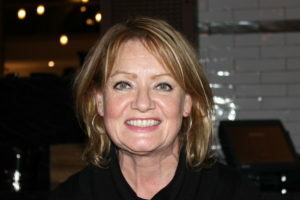 Linda moved to Kelowna 8 years ago from Upper Little Boot, Manitoba. She enjoys explaining treatment options and supporting the doctors as they treat the patients. Linda is a key member of the local rollerskating racing team, and also strolls through her neighbourhood walking her pet skink, Spiny Norman. For over 3 awesome years, Colleen has been our receptionist, greeting our patients with her cheery attitude, and ensuring the office is running smoothly. Born in Moosomin, Saskatchewan, Colleen and her husband, Steve, with their two kids, now live in Kelowna, spending their time travelling, golfing, running and hiking! Dirrae is our hygienist on Fridays and is a great asset to our team. She loves horses and often competes in equestrian competitions. 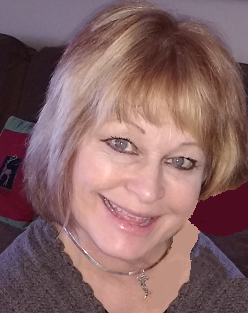 Nancy works with Dr. Edmond on Fridays and brings a wealth of assisting experience. Bio coming soon. 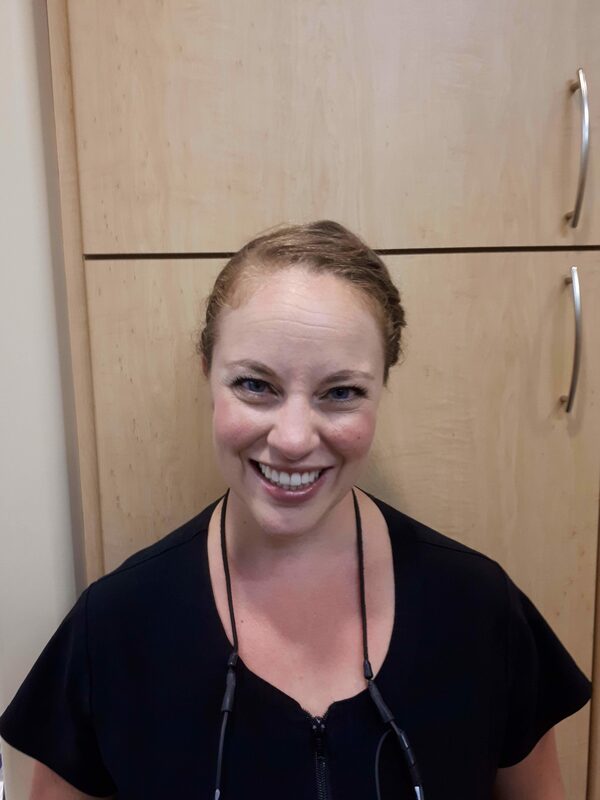 Nicole brightens our Mondays as our front op hygienist. She is currently in accelerated Invisalign treatment and looks forward to her wedding this summer!